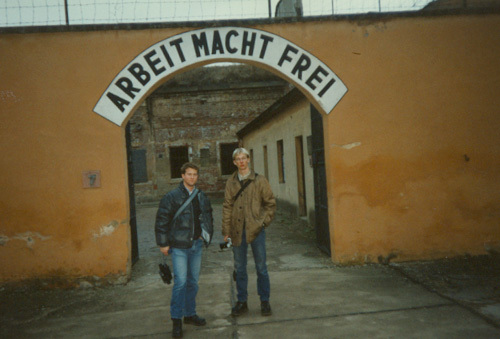 I visited Terezin in 1997. The text is taken from the broschyr from the camp, and so is all the pictures except the one with the text "Arbeit macht frei"
The Small Fortress was built in the late 18th century as part of the fortification system near the confluence of the Elbe and Ohfe rivers. It was named Terezin after the Empress. Almost since the very beginning it was used as a prison where apart from the soldiers, many people related to the nationalist-liberation struggles in central and southeastern Europe were jailed (such as the leader of the anti- Turkish uprising in Greece A. Ypsilanti, or Hungarian and Prague rebels in 1848). During World War One, Franz Ferdinand d'Este's assassins and participants of the Rumburk uprising were imprisoned here. When Bohemia and Moravia were occupied by the Nazis and the existing jails were gradually filled as a consequence of the Nazi terror, the Small Fortress became the Prague Gestapo's prison in 1940. The first prisoners came there on June 14, 1940, and some 32,000 inmates, including 5,000 w omen went through the fortress throughout World War T wo. They were mainly Czechs but later also other nationalities, e.g. citizens of the Sovjet Union, Poles, Germans and Yugoslavs, and towards the end of the war also prisoners-of-war from the British army, Franch hostages etc. The life of imprisoned Jews was especially difficult. The majority of prisoners were people arrested for various forms of protest against the Nazi system, including members of all kinds of resistance movement (e.g.the Defence of the Nation, the Petition Committee "We Shall Remain Faithful", the illegal Communist Party, the Sokol organisation, firemen and many local groups). For most of them, the Small Fortress was but a way station to Nazi trials, jails, penitentiaries and concentration camps where some 8,000 perished. 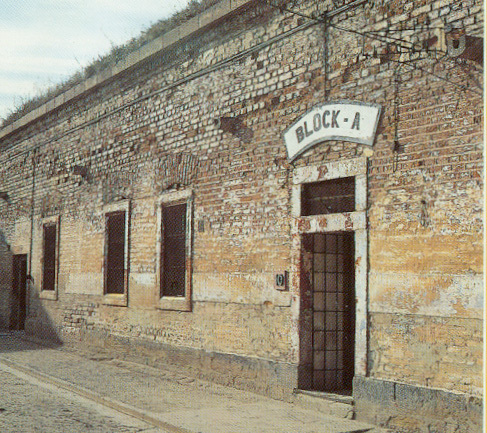 In Terezin itself, some 2,500 inmates died of bad jailing conditions, disease and torture by the guards. At the end of the war, an epidemic of spotted typhoid fever spread in the overcrowded prison and the Nazi management took no steps to stop it. When the guards escaped on May 5, 1945, a campaign to help was launched by physicians and nurses from Prague and Roud- nice n.L., assisted by local population. On May 8, the first Soviet armoured vehicles arrived in Terezin. The epide- mic was ultimately done away with by the Soviet medical staff. The repatriation of former inmates was under way until August 1945. Between 1945 and 1948, the Small Fortress served as a detention camp for the Germans expelled from Czechoslovakia. Inspired by the former prisoners and the dead inmates' families, the government decided in 1947 to establish the Monument of Terezfn aimed at reminding of disastrous consequences of the suppression of freedom, democracy and human rights. Look at the map over Terezin!